For the understanding and interpretation of the religions of times past, the imagery of those cultures has always been an important source of information, besides the written sources (if at all available) and the ever-richer archaeological material. The topic of this collection of papers is the religious iconography of cult in ancient Greece. 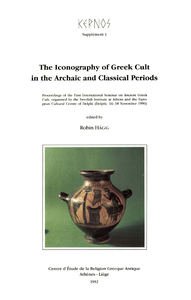 The book aims at promoting the understanding of ancient Greek cult of the Archaic and Classical periods through the presentation of new evidence and new interpretations of vase-paintings, figurines and cult-images.